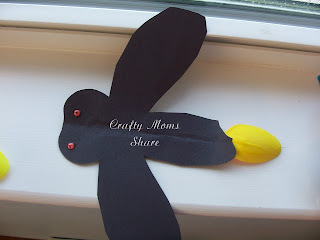 Now for our third and final installment of firefly crafts at least for this summer. If you missed the first two you can check them out here: Part 1 and Part 2. For part 3 we were inspired by Tippytoe Crafts. We had a huge thunderstorm so I couldn't go check them out before we started so we did them a bit from memory. And we made a few changes. First Hazel painted the ends of spoons with glow-in-the-dark paint. After letting the paint dry, I cut out shapes from black construction paper. Had I looked at Tippytoe Crafts I would have realized it would be easier to do several shapes, but I did not. We glued them onto the spoons and then added googly eyes and pipe cleaner antennae. On some we added six pipe cleaner legs as well. Next we used a glow stick. I found glow stick necklaces that are thicker and just have a top with a string attached. I thought these would be perfect since I didn't like the glow coming through the materials on Part 2. We basically did the same thing but glued the black construction paper onto the glow stick. We let the glue dry longer before adding everything else since the glow stick is heavier and bigger. We added legs and eyes and antennae and then hung it in Hazel's house/Horsey's shed depending on what she wants to use it for (today it was a school and a restaurant as well). 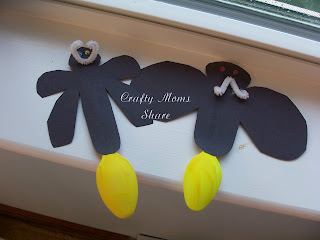 Our final ones are similar to Tippytoe Crafts first ones. However Hazel was not too interested in crafting at this point so we did not use the tissue paper to make the tails. I used a coffee filter and her yellow and green dot markers. Glued that to the black paper and cut out the shape. We have been having a few hot days here in New England. Well today wasn't but the previous few have been. To cool off we decided to make some popsicles. This is the first year that Hazel has really liked a popsicle, but she seems to love them, so I figured we would make some with less sugar. I had bought popsicle molds previously and just never used them. Our first attempt was just simply watermelon. We put some watermelon pieces in the food processor. 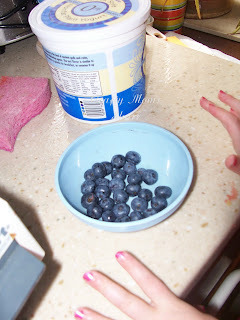 Hazel pureed them and then I put them in a measuring cup so she could pour it into the molds. Then we put them in the freezer. Hazel could not wait to try them, but she had to wait until the next morning. Yes, I let her have a popsicle this morning. I figured I would feed her watermelon in the morning and these popsicles are just frozen watermelon. She enjoyed it, but did not eat it all. 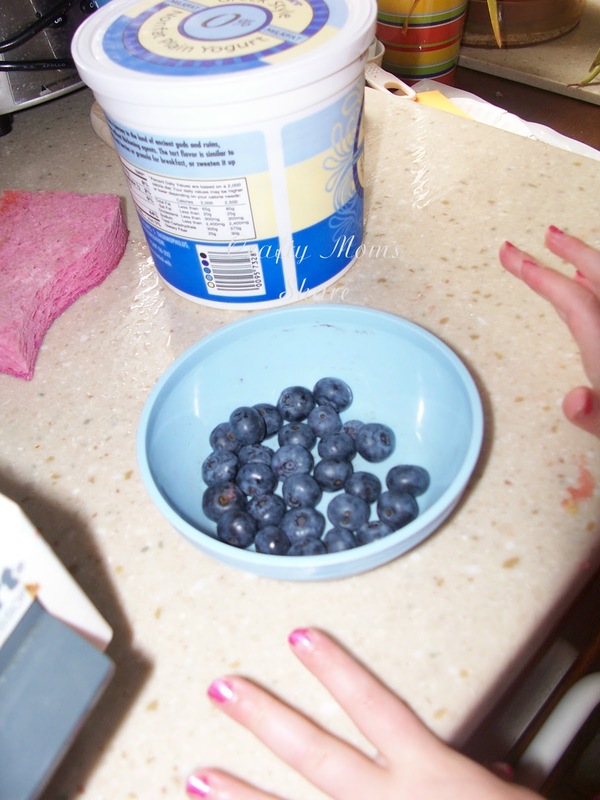 The second flavor we tried was with fresh blueberries, fresh strawberries and plain, non-fat Greek yogurt. Sorry I didn't get many pictures of these, but Hazel and our babysitter enjoyed them this afternoon. Again Hazel did not eat it all, but her eating was very off today. 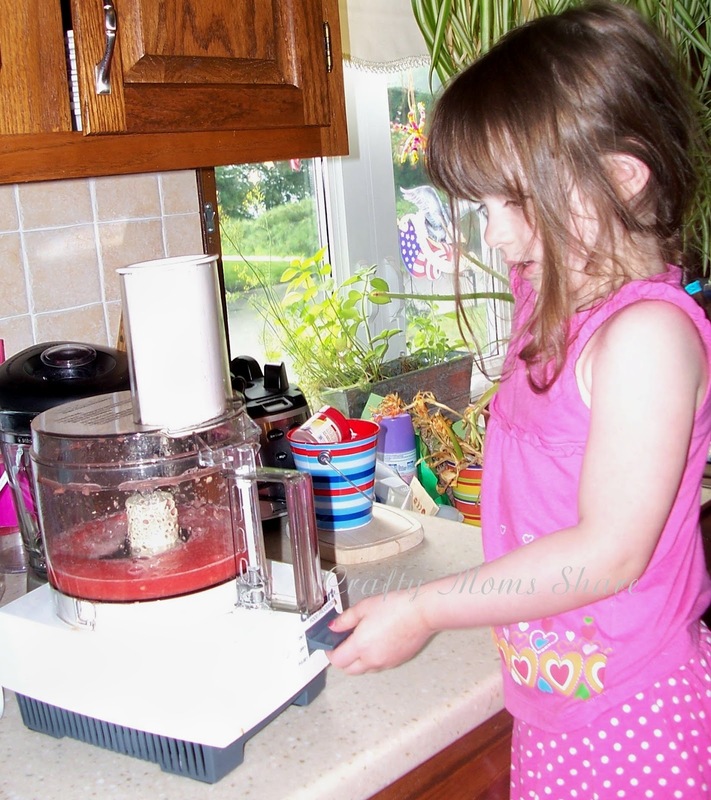 To make them we put some blueberries, cut strawberries and yogurt into the food processor. 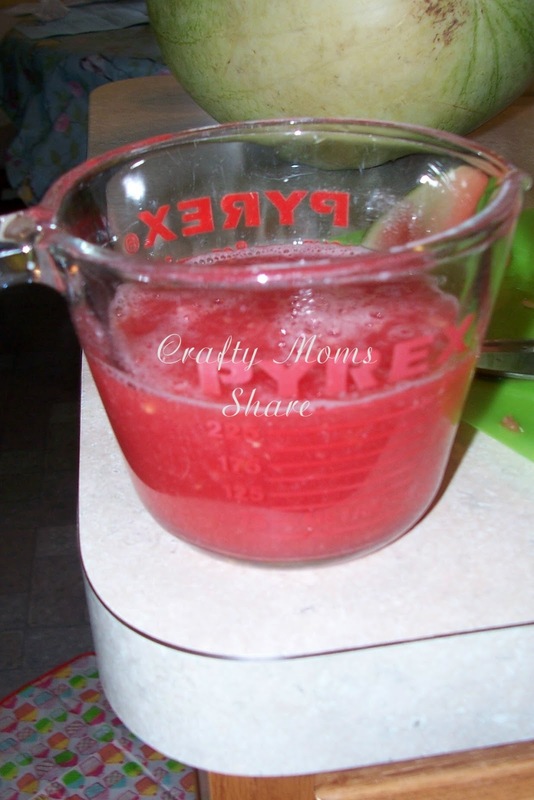 Hazel pureed them and then I put them in the measuring cup so she could pour them into the mold. Then they went into the freezer. Since this mold only made two, I ate the leftover yogurt mixture. Our babysitter said the popsicle was really good. So these are our new summer treats without all the added sugar. 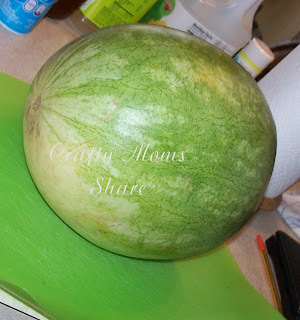 Such a fun way to keep cool! I've really enjoyed all your firefly crafts! And those popsicles sound very refreshing! Your firefly craft is adorable! Oooh, those fireflies are too cute! 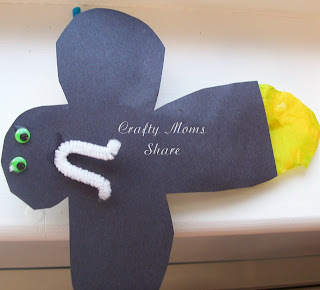 What a fun fun craft! Those fire flies are adorable!! 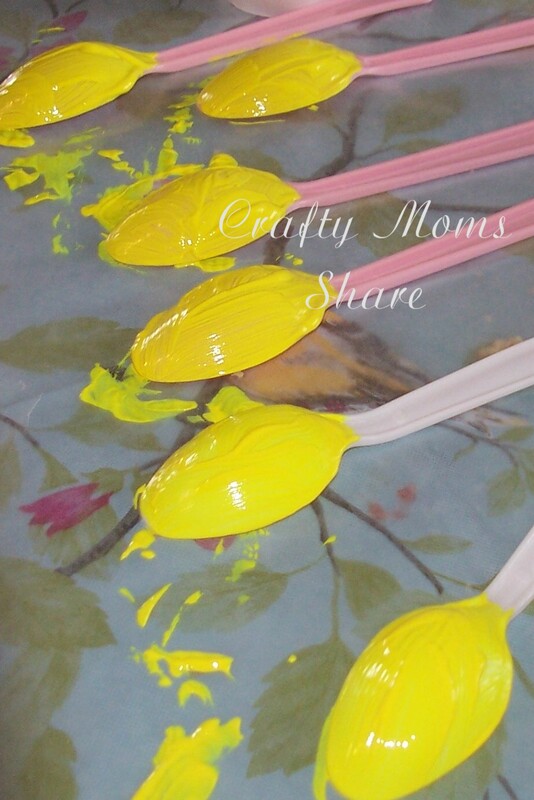 Love the spoon idea! 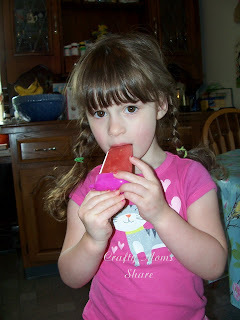 We've tried both of those types of popsicles and the watermelon is a big hit! How cute are those fireflies?! Love it! 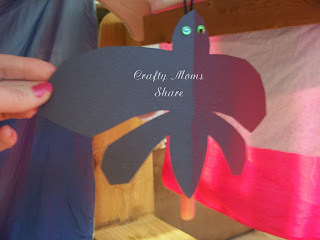 Thank you for sharing at our Pinteresting Party! Your popsicles look really tasty - we call them icy poles here :-) Thanks for sharing at Happy lil ❤'s are baking!